Director – Park Chan-wook, Screenplay – Park Chan-wook, Hwang Jo-yun & Lim Jun-hyung, Based on the Comic-Book Created by Tsuchiya Garon & Minegishi Nobuaki, Producer – Lim Seung-yong, Photography – Chung Chung-hoon, Music – Cho Young-wuk, Lee Ji-soo & Shim Hyun-jung, Art Direction – Ryu Seong-hie. Production Company – ShowEast. A friend bails the drunken and disorderly Oh Dae-su out of the police station drunk tank. The friend turns around outside a phone box and finds that Dae-su has mysteriously vanished. Dae-su finds himself locked inside a small apartment. This remains his home for the next 15 years, where mysterious controllers keep him fed, provide him with tv and even cut his hair while he is anaesthetised. He swears vengeance against those responsible and trains to fight while in his prison. He starts to dig through the wall of the cell using a chopstick. Just as he breaks through, he is gassed, hypnotized and comes around to find that he has been freed. He collapses in a sushi bar and is taken home by a pretty chef Mido, who later becomes his lover. He sets out trying to find the person responsible for his imprisonment, brutally torturing those in his way to get information. Dae-su is then contacted by a mystery man who begins taunting him, sending him on cryptic quest, challenging him to find the reasons behind his imprisonment. In the last few years, South Korean cinema has become increasingly a force to be reckoned with, having relentlessly copied and polished other genres of filmmaking – the thriller, the Asian ghost story, the Hong Kong action film, Wu Xia, not to mention coming up with films that live entirely in categories of their own like the marvellous Lies (1999). 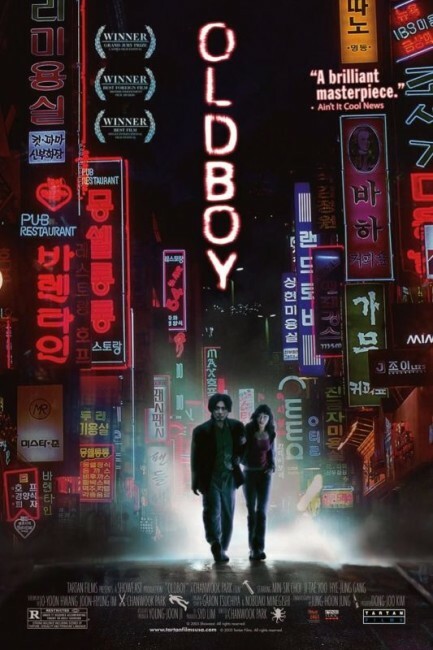 Oldboy comes with considerable acclaim – it won the 2004 Grand Jury Prize at the Cannes Film Festival – no particular surprise in that the head of the jury was Quentin Tarantino. If South Korean cinema is a genre that has rabidly appropriated and imitated other genres, then Oldboy is surely a South Korean imitation of a Takashi Miike film, it reminding in particular of Ichi the Killer (2001). Director Park Chan-wook has down perfect Miike’s eccentric sense of humour and the casually littered violence. Park delves into the same audience-challenging assaults on good taste that Miike regularly does – there is a scene with hero Choi Min-sik eating a live octopus, scenes of him torturing people to get information by wrenching their teeth out with a claw hammer and an almost unwatchably nasty piece of self-mutilation with a pair of scissors at the climax, all of which could sit easily in a Miike film. 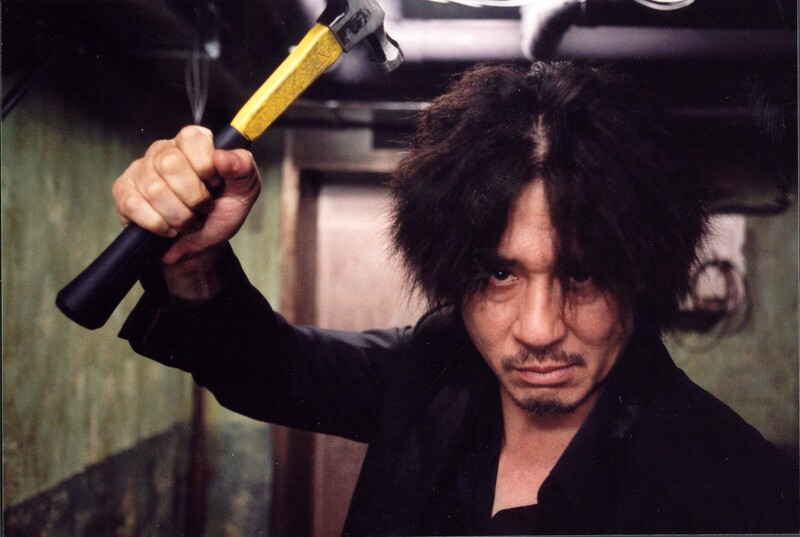 Indeed, the journey that Oldboy takes feels similar to the one in Miike’s Audition (1999), and Park Chan-wook even borrows little Miike eccentricities such as having graphics appear showing the intended trajectory of a hammer held over someone’s head. Oldboy starts out seeming as though it is going to be an ultra-violent revenge film – along the lines of Death Wish (1974), the recent repellently nasty Man on Fire (2004) or some Death Wish imitator. Instead, Oldboy twists its genre around altogether, becoming an existential quest more along the lines of a film like The Magus (1968) or The Game (1997) with the protagonist being put through a cryptic game by a mysterious controlling figure who keeps making him question his own life in search of an answer to the puzzle. The end revelation when it comes is a genuine shocker, one that it at least on the order of similar revelations in The Crying Game (1992) and The Sixth Sense (1999). Although, far more shocking than any of the scenes of wildly histrionic violence that follow is the final coda (set for some reason in the New Zealand Alps) where the hero decides to deal with his pain using a hypnotist. In all regards, Oldboy is a film that genuinely goes the distance, pushing way over taboo lines and holding nothing back. Oldboy was been long announced for an English-language remake, with names such as Steven Spielberg being associated. This eventually emerged under Spike Lee as the heavily disappointing Oldboy (2013) starring Josh Brolin in the lead role. Zinda (2006) was also an uncredited Bollywood ripoff. Prior to Oldboy, Park Chan-wook was best known for Joint Security Area (2000). He has visited the theme of revenge in a number of other films, including Sympathy for Mr Vengeance (2002) and Sympathy for Lady Vengeance (2005), as well as at the climax of The Handmaiden (2016). He revisited the ultra-sadistic territory of Oldboy in the Cut segment of the Asian horror anthology Three … Extremes (2004). Park subsequently returned to genre material with the eccentric comedy I’m a Cyborg, But That’s OK (2006), the vampire film Thirst (2009) and the English-language horror film Stoker (2013), as well as produced the science-fiction film Snowpiercer (2013). (Winner in this site’s Top 10 Films of 2003 list. Nominee for Best Adapted Screenplay at this site’s Best of 2003 Awards).